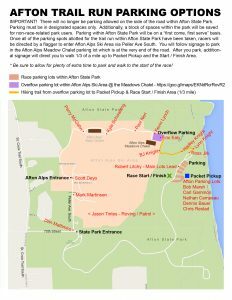 Subject: Afton Trail Run 2017 Parking PlanHi Parking Volunteers! Again this year at Afton we have a little more complex parking plan. Sorry for the long email but if you could take the time to review the email and the attachment, that would be super helpful! The state park has asked that we no longer allow cars to park along the “park road” after the designated state park parking lots are full – so the solution is that we will have overflow parking down at the the Afton Alps Ski Area Meadows Chalet parking lot – runners will be able to hop onto the parks trail system from there per the attached map to walk about 1/3 of a mile to the race start. In the past Robert Litchy has done a great job heading up parking for us at the state park lots and will do so again this year but we will also have to have key volunteers at specific points leading into both the park and into Afton Alps to guide cars in and divert cars to the Afton Alps lots once the lots at the state park lots are full. So the plan is that once the lots (less 20 spots or so for non-race related day users and a couple of spots for anyone who is running drastically late to the race) are filled, Robert Litchy will call Dan Mattimiro who will be at the entrance of the park and tell him to start diverting cars down to Afton Alps. Dan will also be in phone contact with Kevin Lynch who will be down at the Meadows Chalet parking lot just in case some communication is needed. Once parking is pretty well finished up at the state park, those helping in the state park lots lots can walk down the trail leading up to the park from Afton Alps to provide direction / answer questions and ease the minds of those that are walking up . The attached map shows where everyone on the parking team will (roughly) be stationed. Robert Litchy has a good handle on what is going on at the Afton State Park parking lots and Jason Tintes will be overseeing everything outside of the Afton State Park lots, making tweaks as needed – I will be reviewing the entire plan on the ground with Jason, Dan and Kevin so they will all have a good handle on what is going on should you need additional direction on race day. If anyone happens to have an extra safety vest, bring it, otherwise we will have a bin of them at the back of the supply truck in the main lot / near the visitors center – you might want a headlamp as well.